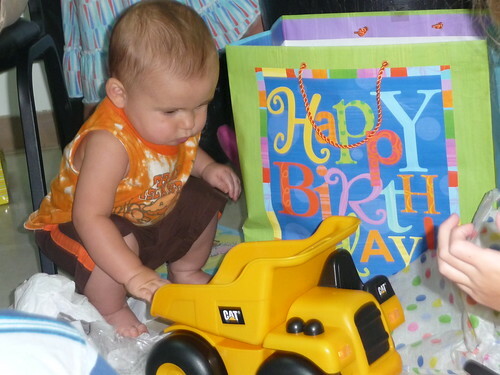 Luke turned ONE on Tuesday and we had his big family party today. Everyone made it except Steve and Angela (we missed you guys) and the Baileys in Seattle (we missed y’all too). It was extremely hot. At one point on our front porch today it was 105. 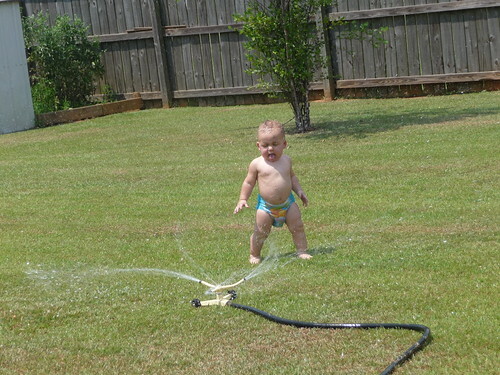 All the kids stayed in the pool and Luke ran around in the sprinkler. I made his cake. Though my family didn’t think it was very creative, I thought it turned out cute. 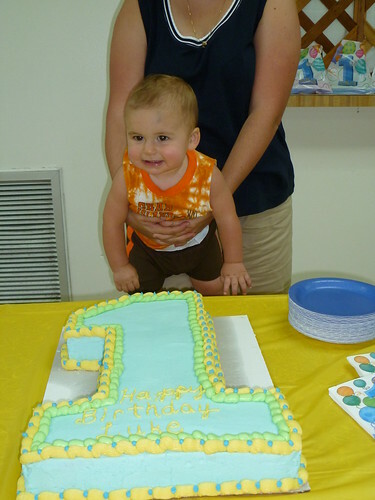 Here is Luke with his first birthday cake made by his Mama. Luke had a blast! He likes to watch everyone and be right in the middle of all the action. 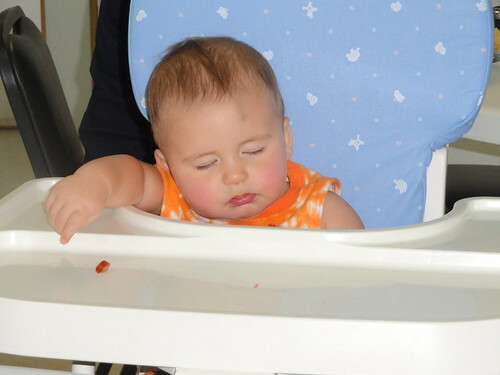 So, he wouldn’t take a nap and he fell asleep during lunch. Of course when we tried to lay him down he woke back up and wouldn’t go to sleep again. 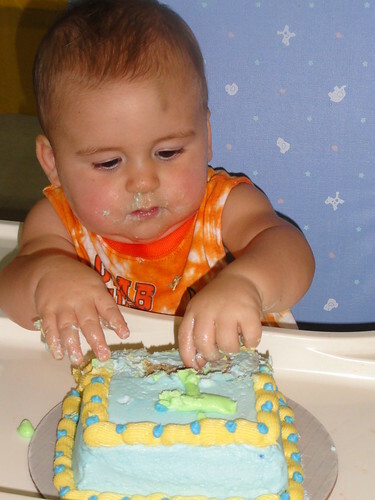 So, we decided to eat cake. 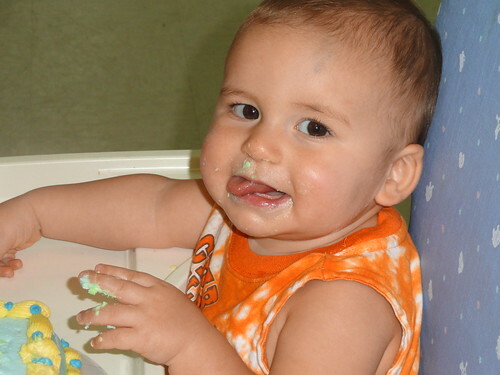 Here are a few pictures of Luke enjoying his cake. I have to say, I thought he would have “dug in” a little more than what he did. But he still enjoyed it. 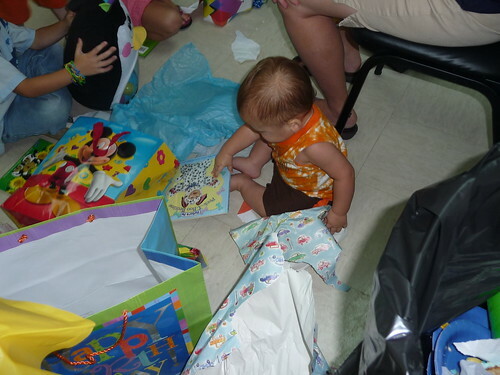 After cake, Luke opened his presents. Well… he opened a few and then decided to play with the paper while I opened the rest of the presents. Here are a couple more pictures of him enjoying his presents. Thanks to everyone for all of the gifts and love today. Oh, and before anyone asks, Yes! 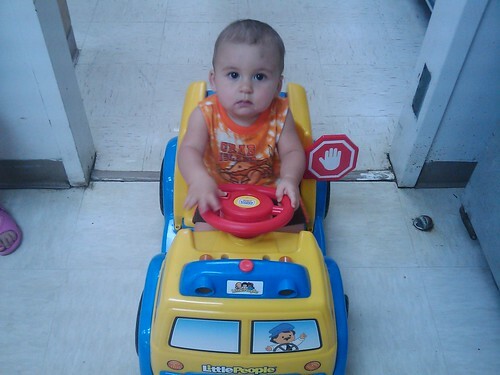 That is a bruise on his head. He thought he’d be smooth the other day and tried to turn on a dime to get back into the bathroom as I was closing the door. He learned that he doesn’t have the skills to make those dime turns and he fell into the door case. Glad he had a fun birthday! 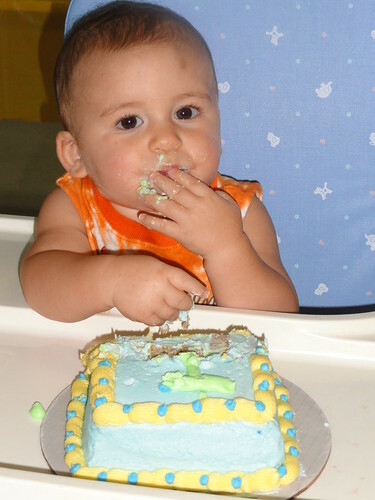 Happy birthday little guy! We miss you guys but we're not missing the heat! It is UNBELIEVABLY HOT! It takes your breath away when you walk out the door. We do miss you all too! The girls like to look at the pictures and videos of the kids. Do y'all have a trip planned for this fall?